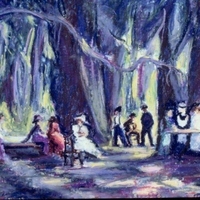 A painting by Bettye Reagan, a local artist in Central Florida, inspired by a photograph of a picnic at Meads Woods near Oviedo, Florida. Mead Woods was named after Dr. Theodore Luqueer Mead (1852-1936), who was famous for hybridizing orchids, amaryllis, and caladiums. Dr. T. L. Mead migrated from New York to Eustis, Florida, in 1869, and then to Oviedo in 1886. At his 85-acre estate in the Lake Charm area, Dr. Mead conducted experiments and accumulated one of the world's largest butterfly collections. Original painting: Reagan, Bettye. Meads Woods Picnic No. 2. Year: Private Collection of Bettye Reagan. 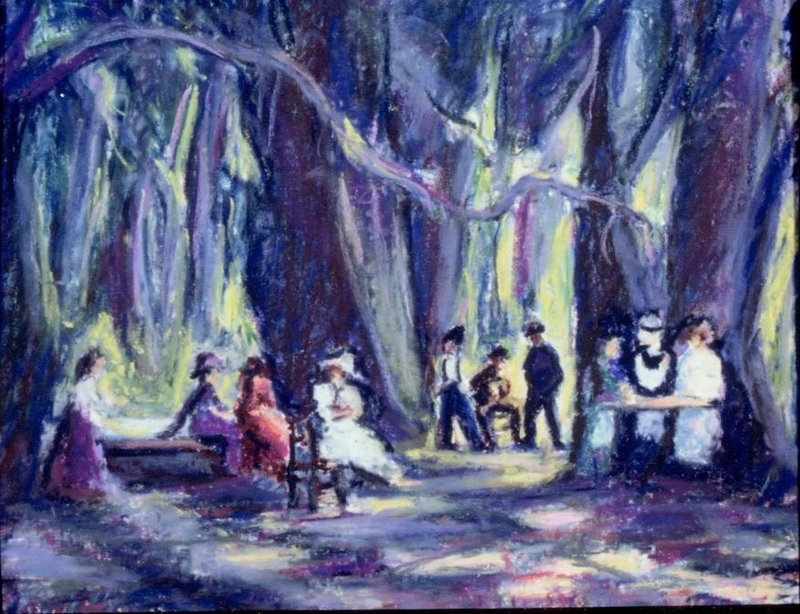 "Meads Woods Picnic by Bettye Reagan." RICHES of Central Florida. https://richesmi.cah.ucf.edu/omeka2/items/show/6952. Digital reproduction of original painting: Reagan, Bettye. Meads Woods Picnic No. 2. Year. "Picnic at Meads Woods." RICHES of Central Florida. https://richesmi.cah.ucf.edu/omeka2/items/show/6951. "A Guide to Theodore L. Mead Collection." Archives and Special Collections, Rollins College. http://lib.rollins.edu/olin/oldsite/archives/mead.htm. Reagan, Bettye Jean Aulin. “Meads Woods Picnic No. 2 by Bettye Reagan.” RICHES of Central Florida accessed April 22, 2019, https://richesmi.cah.ucf.edu/omeka/items/show/6953.